Infibeam is now the authorized reseller of iPhone 5c and iPhone 5s which will be available on Infibeam hopefully from 1st November according to Apples international press release that we covered earlier. Desperate Apple Fans can visit the site and click on “Tell Me When Available” link to get the availability information as fast as possible.The 16 GB iPhone 5c and iPhone 5s will be priced at Rs. 41,900 and Rs. 53,500.
iPhone 5c is not the cheaper iPhone most people expected and that seems to be a lot of money for a “unapologetically plastic” phone as put by Apple. Having said that, iPhone 5c packs powerful hardware on the inside mostly similar to what we saw on iPhone 5 and comes with the latest iOS 7 operating system. The phone runs on Apple’s A6 chipset and features 4 inch Retina display which is one of the best IPS LCD displays available with extremely good viewing angles and outdoor visibility. The display is rich in color and offers good contrast and darker darks then other LCD displays. The battery backup will last for around 10 hours. The iPhone 5C comes in Blue, Green, White Pink and Yellow color and you can buy the 32 GB variant for Rs. 53,500, for that price you can also get iPhone 5s 16 GB which will make lot more sense. You can read the complete specification details on our iPhone 5c Quick Review. The iPhone 5s is a different beast all together. It comes with 64 bit A7 chipset which is more than a gimmick. It can be better termed as timely preparation for the future and the chipset based on ARMv8 leaves the age old ARMv7 32 bit architecture which will help iPhone in handling the imaging process better and also will lead to better power optimization which comes as an advantage of new technology. The 32 bit apps are also compatible. The iPhone 5s comes with a 8MP camera now comes with an F/2.2 sensor and 5 element lens, supported by True tone LED Flash to shed the washed out feel from your images. The display is the familiar 4 inch Retina display. 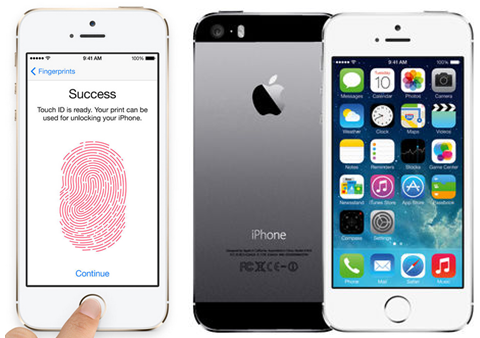 The phone also sports a finger print scanner clubbed with the Home button which can be used to unlock home screen. You can read the complete spec details on our iPhone 5s Quick Review. This 32 GB and 64 GB variants will be available for 62,500 INR and 71,500 INR respectively. You can visit the iPhone 5c and iPhone 5s order page on Infibeam and click on “Tell Me When Available” link. Infibeam will mail you as soon as the product is ready for shipping.